Regina Shober Gray was an energetic and well-educated woman of her time. Her diary abounds with visits to the theater and to commercial art galleries (the precursors of museums), so I thought it might be interesting and valuable to dip into her reading material, often left to the end of the day and for the benefit of her young children. Tuesday, 14 February 1860: Have finished “Hodson’s Twelve years in India” – a most interesting book but, oh, so painful. Must the world and life always be so crowded with “oppression and deceit, of unsuccessful and successful war”! But he was truly a noble fellow – one of “Arnold of Rugby’s” men – said to be the “Scud East” of School Days at Rugby. Oh, that terrible, terrible Indian mutiny – how it mowed down the best and bravest, fair women and innocent babes. Saturday, 10 March 1860: Very busy at sewing machine till noon. Dressed and made calls, but was admitted only at Georgina Lowell’s – a singularly lovely looking girl, but too fragile. Met Harriet Gray there, who looks well and seems happy in her new sphere of duty – a great blessing to her uncle and his motherless children she must be too. Mary [Gray] took tea with Jessie Gordon – [the boys] played billiards, & Doctor being out I finished “Friends in Council” (2d series), a fascinating book, and closed my quiet evg. with sewing and talk when he came home. Tuesday, 20 March 1860: Mary has a dozen children upstairs at some “theatricals”!!! “The Stolen child”! It seems to be full of sound and fury at least. The boys, quite indignant at not being admitted, have attempted a classical revenge – by pinning a label (“To the fairest”) on to Morris [Gray]’s woollen ball, and tossing it into the forbidden precincts as an “apple of Discord”! Monday, 26 March 1860: A busy day, yet filled up with trifles, too. A call from Mrs. Shober and Aunt Sarah – … afterwards Mother Gray dropped in. All which interruptions, though very agreeable, delayed the finishing off of my “odd jobs.” Sewing circle at Cornelia Dehon’s – [a] pleasant meeting. Dr. G. went to Folger’s lecture, and I had a quiet evg. with the children. Persuaded Sam [Gray] to go early to bed, with Regie [Gray] – which he consented to do, feeling quite poorly with his heavy cold, if I would sing to him awhile after they were in bed. Read a little in “Compensation” – like it much. Have finished Miss Nightingale’s vol. on nursing – full of excellent suggestions – but she must have come across strangely unneat people in her experience. And what a wonderful experience she has had. A woman who would be canonized in Rome! Tuesday, 10 April 1860: Rain again. Mary cannot study just now – a heavy cold in her eyes – so she busied herself cleaning her Paris doll with Jouvin’s glove cleaner, and packing its wardrobe for Philad[elphia], while I served all the morning. Drove to Pine Bank with Mother Gray – a raw east wind. I fear an attack of rheumatism in my shoulders, par consequent; they feel stiff and creaky. Read 2 acts of Macbeth to Mary after tea, and treated myself to the “Marble Faun” when the children retired. Have finished “Hayes Arctic Boat Journey,” [a] large part of which I read aloud to the children – a most interesting account, and quite well written. Wednesday, 11 April 1860: Rained great guns all day. Took Mary to dancing class – the last afternoon of the season – very crowded & as usual a very pretty scene. Home at 7½ o’clock tea; read 3d act Macbeth to children, which they seemed to think rather awful, with the horror of Banquo’s ghost! Finished the evg. with the “Faun” – a fascinating but most unsatisfactory book. Hedwiga Regina Shober of Philadelphia (1818–1885) was married to Dr. Francis Henry Gray of Boston 1844–80. All entries from the Hedwiga Regina Shober Gray diary, R. Stanton Avery Special Collections. Hodson of Hodson’s Horse, or Twelve Years of a Soldier’s Life in India, by Major W. S. R. Hodson, published posthumously in 1859. Thomas Arnold (1795–1842), the influential headmaster of Rugby School from 1828. A character in Tom Brown’s School Days (1857) by Thomas Hughes (1822–1896). Georgina Lowell (1836–1922), a niece of Dr. Gray’s aunts Mrs. John Chipman Gray and Mrs. Horace Gray. Her father’s house was at 12 Chauncy Street in 1860. Harriet Gray (1832–1923), Dr. Gray’s first cousin. The wife of her maternal uncle Henry Upham died in June 1859. Mary Gray’s friend Jessie Gordon (1848-1884), who married Gardiner Sherman in 1881. Presumably Friends in Council, a Series of Readings and Discourse thereon (1847–59) by (Sir) Arthur Helps (1813–1875). Perhaps a reference to Anna Cora Mowatt’s unpublished operetta The Gypsy Wanderer, or The Stolen Child, the plot of which she describes in her 1854 memoir, Autobiography of an Actress, or Eight Years on the Stage. The diarist’s youngest son Morris Gray (1856–1931). 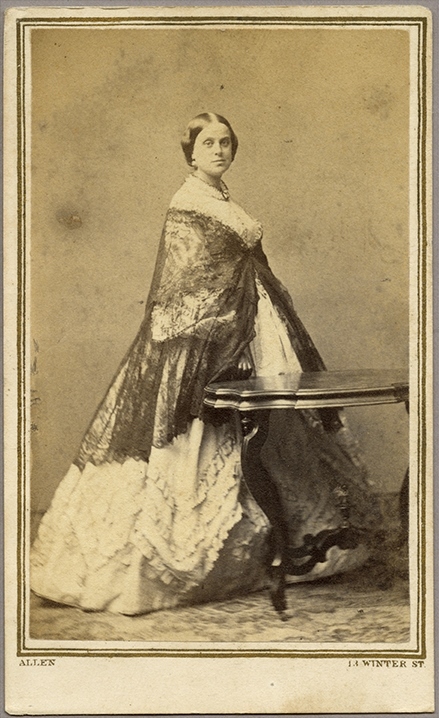 Mrs. Gray’s stepmother, Lucy Hall Bradlee (1806–1902), who was married to Samuel Lieberkuhn Shober 1830–47. Mrs. Shober’s aunt Sarah Fletcher Bradlee (1789–1866). Dr. Gray’s mother, Mary Clay (1790–1867), who was married to William Rufus Gray 1809–31. Cornelia Dehon (1820–1904). In 1860, her brother William lived at 12 Louisburg Square. The diarist’s sons Samuel Shober Gray (1849–1926) and Reginald Gray (1853–1904). Compensation, or Always a Future (1860) by Anne Maria Hampton Brewster (1819–1882). “The Lady with the Lamp,” Florence Nightingale (1820–1910). Her Notes on Nursing: What It Is and What It Is Not was published in 1859. The summer house of Dr. Gray’s brother and sister-in-law, Mr. and Mrs. William Gray, in Brookline. Shakespeare’s Tragedy of Macbeth (1611). The Marble Faun (1860) by Nathaniel Hawthorne (1804–1864). An Arctic Boat Journey in the Autumn of 1854 (1860) by Dr. Isaac Israel Hayes (1832–1881).